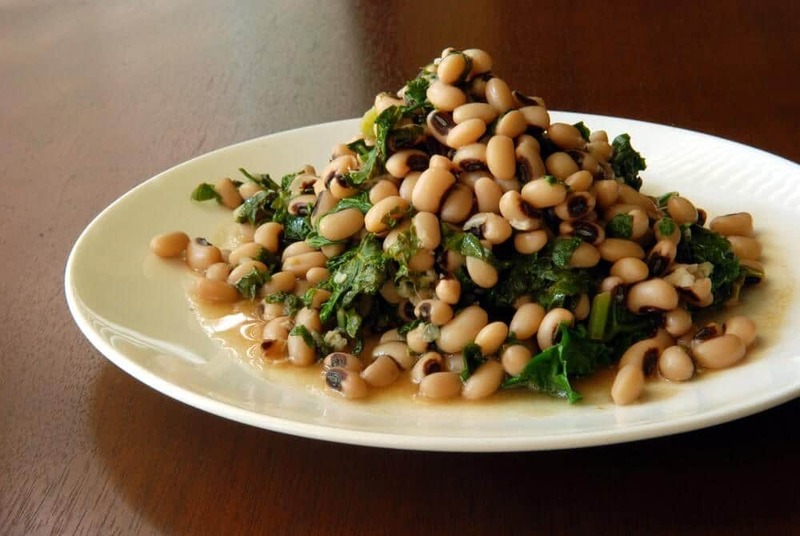 Eating black-eyed peas on New Year’s Day is an old Southern tradition. In fact black-eyed peas have been a symbol of luck and prosperity since Biblical times at least. Here’s a delicious way to enjoy their tasty, lucky goodness this year. Hoppin’ John is a traditional New Year’s dish from the American South that is made with bacon, salt pork or hog jowl, black-eyed peas, greens like collards or kale, and sometimes rice. The peas, since they swell when cooked, symbolize prosperity; the greens symbolize money; the pork, because pigs root forward when foraging, represent positive motion. Some say the dish is named for an old, hobbled man called Hoppin’ John who became known for selling peas and rice on the streets of Charleston, South Carolina, but most food historians think the name comes from a French term for dried peas, “pois pigeons.” It’s also uncertain why the dish became associated with New Year’s and good luck. Some people believe you should cook your New Year’s Hoppin’ John recipe with a new dime or penny, or add it to the pot before serving. The person who finds the coin in their portion will be extra lucky that year. Some say you should eat exactly 365 peas on New Year’s Day. If you eat any less, you’ll only be lucky for that many days. (I guess on leap years, you need to eat an extra pea.) And of course, if you eat any more than 365 peas, it turns those extra days into bad luck. Some say you should leave one pea on your plate, to share your luck with someone else. Others say if you don’t eat every pea on your plate, your luck will be bad. It’s also said that if you eat only black-eyed peas, and skip the pork, collard greens and the accompaniments, the luck won’t stick. They all work together or not at all. But cultural mythology notwithstanding, this Hoppin’ John recipe is fast, easy, yummy and nutritious, so we enjoy this dish (without the dime) anytime greens are in season—not just on New Year’s Day. I don’t use rice in my Hoppin John, keeping it lower carb and grain free. Note: If you are unfamiliar with salt pork, ask for it at your butcher counter in your local grocery store. It is similar to bacon, but unlike bacon it is not smoked or cured, and is generally saltier. It ranges in cut from lean to entirely fatty, and is used in American cooking to add flavor to foods like baked beans, greens, potatoes or green beans. Eating black-eyed peas on New Year's Day is a Southern tradition. This Hoppin' John recipe is a delicious way to enjoy their tasty, lucky goodness this year. Remove pork and set aside, leaving the fat. Add chopped onions to the pork fat and cook until clear. Add cooked black eyed peas and garlic and sautée 2-3 minutes more. Add chopped kale and thyme, and sautée until fully cooked down, about 5-6 minutes. Return crispy salt pork to the mixture and cook 2-3 more minutes. Season with salt, pepper and hot sauce (if using) to taste and serve. Made this using bacon and my own seasoning choices. Came out nice, thanks.